Panoramic Power, the leading provider of device level energy management solutions announced the release of its PowerRadar mobile application. Addressing the needs of facility and operations managers for real time visibility into their business, the PowerRadar app delivers easily accessible energy data on their mobile device. Users can visualize and monitor energy consumption, historical data, benchmarking and insights on their facility operations and respond to alerts and notifications in real time. They can utilize natural multi-touch gestures to swipe through operational and energy data, drill down into areas that need attention, monitor operational conditions and measure and benchmark energy KPIs. With PowerRadar Mobile, users are made immediately aware of critical alerts with notifications that are delivered via text message or email, and also are displayed on the start screen. "Access to actionable information based on accurate data is a growing priority for facility managers. Mobile applications that give these customers information about how their building systems are operating in real time, at the device level, are increasingly valuable," said Casey Talon, Senior Research Analyst at Navigant Research. "This kind of intelligent building offering helps customers do more with less time, and when the hardware is cost-effective and the information is accessible on their tablets and cellphones, there is a business case for investment." With detailed usage and historical analysis, customers will better understand their operations and be empowered to make better energy and operational decisions. 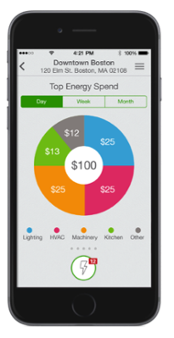 PowerRadar mobile will help users meet energy efficiency objectives with actionable insights at their fingertips. "The PowerRadar mobile application delivers a rich, full visualization view, enabling users to be in control though real-time visibility and analyze energy consumption, anomalies and the operational performance of assets from anywhere and at any time," said Yaniv Vardi, CEO at Panoramic Power. "Plant operators and supervisors no longer need to be bound to their office computers, and corporate executives are just a touch away from real-time operational and performance data that impacts their organization's bottom line." "The Panoramic Power mobile application is clearly structured and easy to use, delivering useful energy information," said Claus Burger, CEO at RightEnergy GmbH. "It shows real-time alerts and I use it to quickly see how systems are performing." For more information, please join us for a 30 minute webinar demo on Thursday, October 8, 2015 at 12:00 ET. Click here for more information. Panoramic Power, the leading provider of device level energy management solutions, enables businesses to optimize their energy consumption and improve system level performance and operations. Using innovative and affordable wireless sensor technology and a cloud-base analytics solution, companies across a wide range of industries gain insight into their energy usage and are able to optimize operations, processes and maintenance resources. For more information, visit www.panpwr.com. 0 comments on "Panoramic Power Introduces PowerRadar Mobile Application for Real-Time Facility Operations and Energy Management Data"